Berlin, 15/10/2018 The 25 winners of this year’s Green Talents Competition have arrived in Germany to attend the international Science Forum for highly gifted researchers from the field of sustainable development. That is why, starting today, their individual research profiles will be presented on our website https://www.greentalents.de/awardees-2018.php. The Green Talents programme is under the patronage of the Federal Minister of Education and Research, Anja Karliczek. The award has been honouring talented researchers since 2009 and provides young scientists with a platform for sharing their views on green concepts to make our world a better place. This year, a high-ranking jury of experts selected 25 up-and-coming researchers from among the 736 applicants from more than 100 countries. For the first time ever, Azerbaijan, Belarus, Belgium, Ecuador, Mauritius, Sri Lanka, and Zambia are among the winners’ countries of origin. The prize comprises one of the treasured tickets to the “Green Talents – International Forum for High Potentials in Sustainable Development”. The 25 Green Talents will be honoured during a festive award ceremony attended by representatives of the participating institutions, jury members, embassy representatives and other distinguished guests. You are cordially invited to attend the ceremony to interview the awardees in Berlin or subsequently in their country of residence! 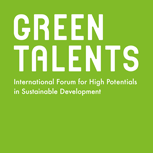 Become part of the Green Talents Science Forum 2018 and follow the posts on www.greentalents.de, Twitter or LinkedIn!